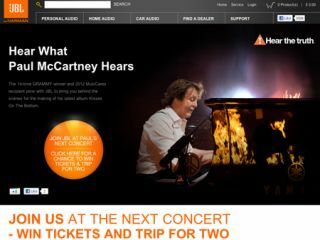 Win VIP tickets to see Paul McCartney in concert with JBL | What Hi-Fi? JBL is running a competition to win VIP tickets to see Paul McCartney in concert in Rotterdam, Antwerp or Munich this March. The company has teamed up with McCartney as part of the Hear the Truth campaign which encourages consumers to hear music the way the artist intended. Former Beatle McCartney, a 14-times Grammy winner, will perform his new single My Valentine from the album Kisses on the Bottom. All fans have to do to be in with a chance of winning one of six concert packages (consisting of two concert tickets, flights and a night for two people in a 4-star hotel) is to tell JBL why they should be chosen. Winners will be picked based on the originality of their entry, and the competition runs until noon on March 12th, 2012. Winners will be notiified on or before March 15th. To enter, click on this link. The competition is open to residents of the UK, Netherlands, Belgium, Denmark, Sweden, Finland, Germany, Austria, Switzerland and France.